Hello everyone! I’m new here to the BestLeather crew but I’m a leather enthusiast the same as everyone else with a special place in my heart for footwear. Many companies have their take on the service boot, but the Canadian company Viberg is widely known for their impeccable interpretation of it. Viberg has many different models of the service boot and this particular pair that I’m going to be reviewing is from Blue Button Shop. Viberg was founded in 1931 by Ed Viberg and has been family owned and operated into the present day by 3rd generation family members. Viberg is based in Victoria Canada and in the last 5 years has expanded their work boot line into the fashion market. They use top of the line materials from leather sourced from Italy and US tanneries, Swiss hobnails, and Vibram soles. Viberg’s fashion line of service boots are mainly constructed using a stitch down method of manufacturing. While they do use a Goodyear Welt on some of their footwear they are known for their use of the slightly more unique stitch down method. This particular pair is built on their sleek 2030 service boot last using Horween color 8 chromexcel leather, structured perforated cap toe, 8 antique brass eyelets, and British Dainite out soles. For anyone unfamiliar with Horween’s chromexcel it is an excellent oily pull up leather that ages and develops a patina that is hard to match. It can be prone to loose grain at times but my pair appears to be free of that entirely and is creasing beautifully. Scuffs and scratches wipe away with your finger or light brushing of a horsehair brush. Outside of nit picking minor scuffs from shipping the boots are immaculate. The Horween leather uppers are thick and substantial, stitching is immaculate, and the presentation from Blue Button Shop is excellent. 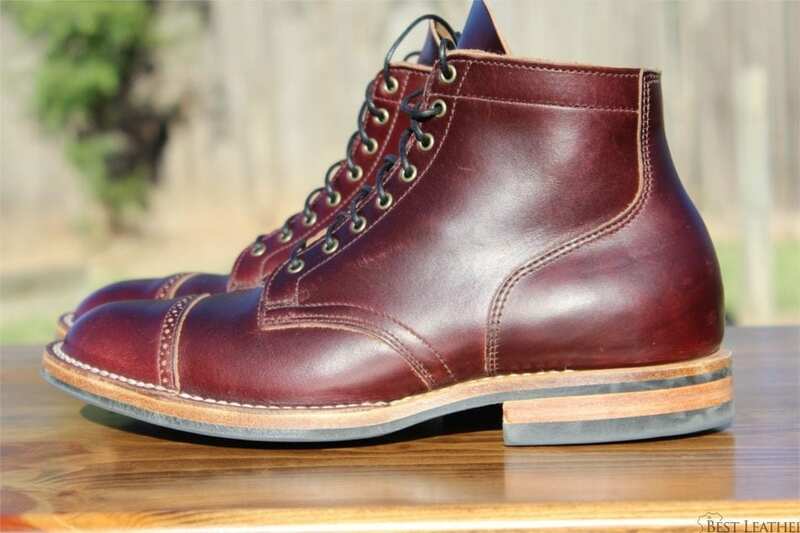 As is the case with most boots, Viberg’s on the 2030 last run a half size larger than Brannock sizing and possibly an entire size larger than what one would wear in sneakers. My feet are a slightly wide 8D on a Brannock device but not quite an 8E and this pair in a 7.5 fit great with thin to medium weight socks. If I wanted to wear really thick socks I would likely have to size up to an 8. For reference I wear a 7.5 in Red Wing Iron Rangers, a 7.5 in the Alden Barrie last, and an 8.5 in most sneakers unless they provide wide sizes. The color 8 Horween chromexcel is an elegant deep eggplant color with red undertones that comes through in sunlight. The Dainite sole keeps the silhouette lean while providing a suitable amount of traction while being hard wearing and make the boots wearable in inclement weather. This particular pair of boots pair well with both denim and chinos. They work well for me both on the weekends and in my business casual setting at work. These are not my first pair of Vibergs so I knew what to expect, but everything about these boots checked all the boxes I wanted. They came with a pair of black and brown waxed round laces and I’m not sure which I like more at this point. The price tag for Vibergs is a large step up from other service boots like Red Wing but there is an aesthetic they provide that can’t be found easily elsewhere. They are much sleeker and slim than other boots in the fashion work boot space and that’s a large part of the cost. Viberg’s pattern and high quality combined create a truly awesome product. If you can tolerate the price or are a footwear fanatic like myself, you can’t go wrong with Viberg. They make boots and shoes in an astounding number of leathers and construction methods so there is bound to be a makeup that you’ll fall in love with, either from Viberg directly or one of the many stockists. IT Professional with a taste for the finer things in life. Lover of all things high end especially footwear, clothing, watches, and the small things we carry in our pockets.